Could this men's DISCO SHIRT be any more reflective?! These pale or light gold shirts have the look of liquid vinyl. They are actually a soft, thin, lightweight and slinky polyester fabric. 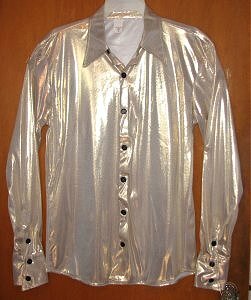 The very lightweight shiny shirts were made in the USA. They have nice long arm lengths, especially the larger sizes. Behind the gold metallic coloring of the shirts is a white background that is hard to see. The shirts have black buttons. They should be hand washed and hung dry or machine washed on gentle, no dry cleaning. They do not shrink. The OUTRAGEOUSLY BRIGHT and SHINY shirts are perfect for a 1970's theme party, a Pimp 'n Ho Party or for performing in a 70s cover band. You might want to state your chest size when ordering under the Special Comments section on the order form. I resize every shirt myself before shipping. Various disco chains, vintage and repro Sunglasses are available further down. Gold the color of jewelry with a bit of black in it. Goes better with black pants.